A REPUTATION THAT’S SECOND TO NONE. Composite Floor Decks Limited was founded in 2005, when its parent company at the time,UK’s Studwelders Composite Floor Decks Ltd identified an opportunity to expand its established welding expertise into associated product areas, and offer these services in New Zealand. The business was acquired in 2016, and is now a wholly owned subsidiary of Steel & Tube Holdings Ltd, which has the license to manufacture and market ComFlor® in Australasia. Through Composite Floor Decks Limited, Steel & Tube has enhanced supply chain capabilities, creating an end-to-end process from manufacture through to installation. 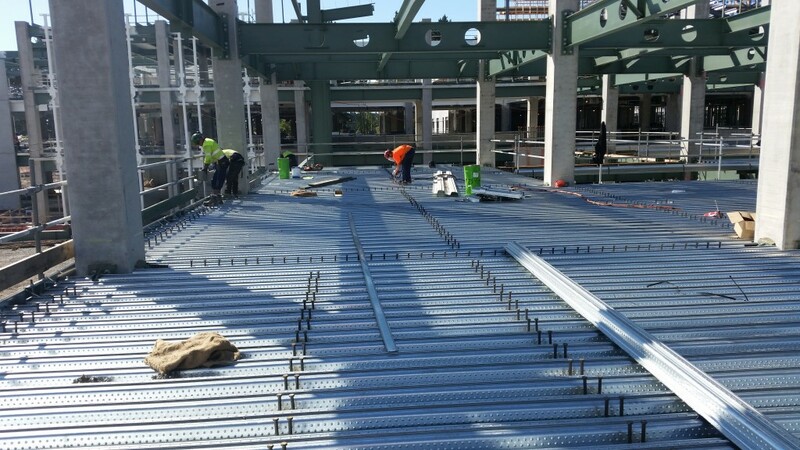 Composite Floor Decks Limited is firmly established within the construction industry as one of the market leaders in the design, installation and stud welding of steel floor decking systems. The business the principal distributor for both Steel & Tube and Dimond, with a comprehensive product range which includes ComFlor® 60, ComFlor® 80, ComFlor® 210, Hibond and Flatdeck, samples of which are shown within this website. Composite Floor Decks Limited understands the importance of technical expertise and speed of communication within today’s fast track construction industry. Therefore its detailing and draughting department, based in East Tamaki, is supported by a state of the art computer system. The company’s self-sufficient installation and welding teams install throughout New Zealand, serviced from branches in Auckland and Christchurch. Throughout its period of growth, Composite Floor Decks Limited has maintained development of its own welding technology and products.